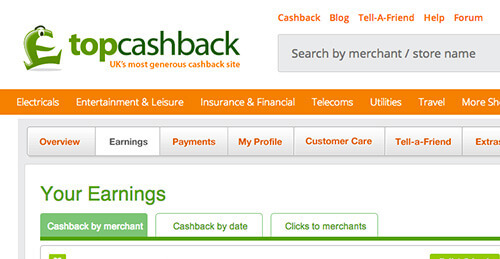 Online cashback, what is it? Online cashback is a tracking link system which allow you to get back a part of the money you spent on your online purchases. Thanks to advertising commission the website receive when you do your purchases, you get a part of it back on your account as ‘online cashback’ which is shown in pounds and pence. It’s entirely FREE to join. There is no minimum payment threshold, over 4,000 merchants, free payout via Amazon.co.uk Gift Certificate, a Love2shop High Street Shopping Card, Tesco Clubcard Points, BACS, Paypal. Green Tick Bonus payment on gift cards. They have a good customer service. This website got some awards and quality testimonials in the press (Telegraph, Daily Express, The Times, Daily Mirror and more), check it out! Step 1: Any time you want to shop online for goods, or sign up to a product or service, simply log into your TopCashback account first. Step 2: Use our retailer directory search box to find the online store you want. We have over 4,000 listed and are adding more and more each day. Step 3: When you have found your chosen store, click through to it using the special link on TopCashback.com, then shop as you normally would. If the online store or product provider you’re looking for isn’t listed in our retailer directory, please contact us and let us know. We’ll try our best to get them added for you to shop at in the future. Step 4: Once you’ve completed your purchase, special tracking information will be passed to the retailer. This will let it report back to us how much cashback you have earned, which we will keep a record of in your account earnings page. Why to use online cashback? It’s free, really simple and it saves you money. Also, it suggests you voucher codes for your preferred merchants when available. TopCahsback is a website we can trust. You will find nearly all merchants you need there. If you have lots of small expenses or some big one, try online cashback now! I personally got a bit more than £50 cashback for this year, I had Amazon gift certificates and got a 5% bonus on the top. Web Tips Copyright © 2019.